with Bill Johnston Next we attack the Spring Perches! 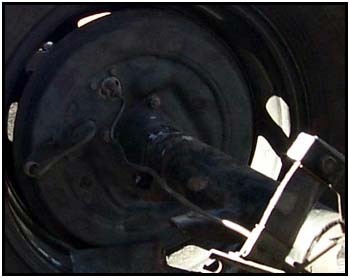 If you were planning to do a SPring Over Axle conversion then this is the time to do it! 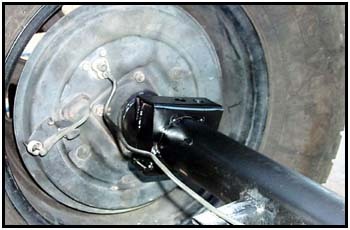 The perches need to rotated so the pinion points to the transfer case. 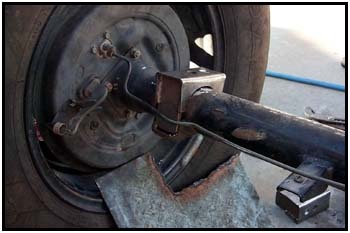 It is much easier to just weld on new perches and go. 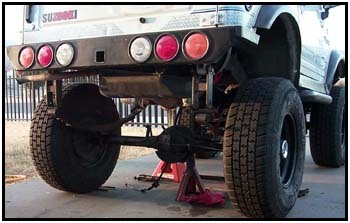 Otherwise you must remove the old components first without damaging the axle tubes. This vehicle had SPOA perches already, so they had to come off. The newly redesigned Rocky Road Outfitters SPOA Perches were used to replace the older perches. These are unique in design because the ends extend to meet the original perches down below. In the photos to the left it shows how much we had to rotate the perch to make up for the 12 degree difference we figured out in the beginning of the installation. We had to grind off a small amount from one "foot" to make the rotation possible. A couple of light tack welds were used to hold the perch in place while we applied the major portion of the heat to where the perches met. 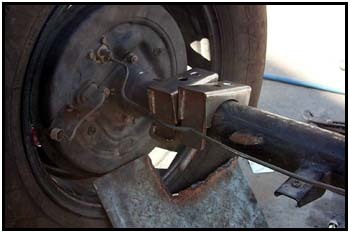 This ensures a solid weld without compromising the integrity of the axle tube. Then a little paint helps to keep the elements out of the nooks and crannies. Now put everything back together - and don't forget the brakes! Now it is time to install the adapter component that Tom includes with the drive shaft. 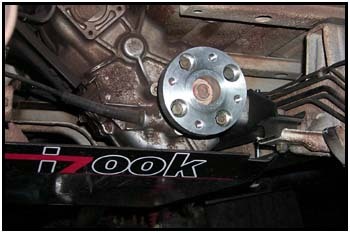 Using the stock bolts, secure it to the transfer case flange. 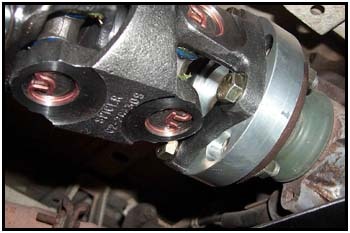 The bolt heads will be below the mating surface so they will not get in the way when you bolt in the CV joint. 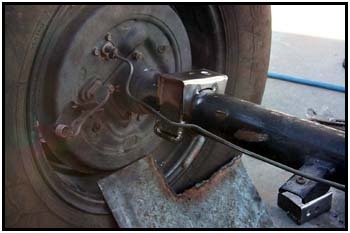 Tom includes the proper bolts to secure the CV joint end of the drive shaft to the adapter. Torque them to factory specs... these drive shafts can handle upwards of 1600 ft/lbs of torque, don't let loose bolts take away your new capabilities! The rear of the shaft will bolt up to the samurai pinion flange. I had a little trouble with the mating of these pieces because the pinion nut was coming into contact with the cast metal inside the yoke. A few passes with a file took down the offending metal on the nut and then it fit like a charm. 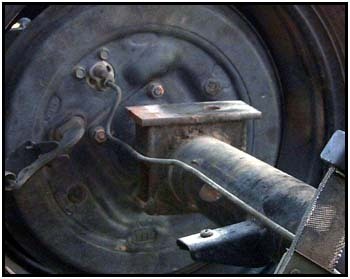 I have talked to Tom about this and he is looking into the possibility that all pinion nuts aren't exactly the same throughout the model years. There should be no problem in the future. Torque everything to factory specs and you are ready to take on the world! Quality components like these come with a hefty price tag. This unit sells for $425 (plus tax if you are a resident of Utah). But let's put this into perspective. 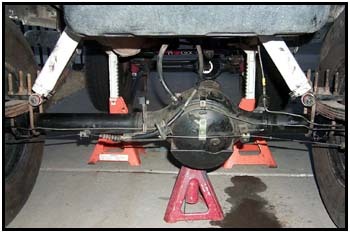 I have two spare rear drive shafts (front shafts cut down for an extended length) in my garage that I have had to replace often because of trail breakage and vibration. Each of those 'junkyard specials' cost me about $120 each time I had to have one replaced or rebuilt. 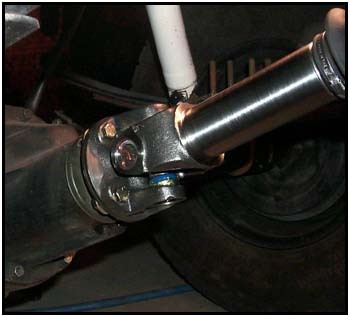 If I had gone with a drive shaft from Tom in the first place I know I would have saved some big bucks by now. For those of you that are thinking of making a purchase but want to save a few bucks, Tom will give volume discounts for clubs or small groups that want to place volume order. 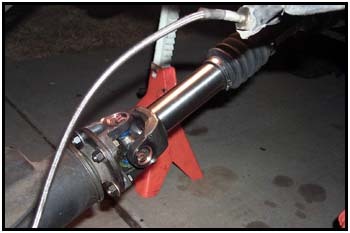 Tom will pick up the shipping charges to get you the drive shaft and components via UPS Ground. I was pleasantly suprised each and every time I talked to Tom during the course of this project. Not only does he make some of the most sought after drive shafts in the business, but he will take the time to talk with you about your application and any concerns you may have. He is also a fountain of knowledge, so don't hesitate to ask him the hard stuff! Click here to check out the extreme product review!